Perfect for lingering over dinner, or lounging over a late breakfast. We repeat. Jacuzzi. On your terrace. Made a last-minute call to leave the snorkel fins and golf clubs at home? The sports desk's got your back. Work out whenever it works for you - the fitness center's open 24/7. Located on the beach, with a beautiful view of the Caribbean Sea. Your kids will love the movies, face painting, video games, lego competitions, sand drawings and other fun activities at the Kid's Club. Unwind with a cocktail at the infinity pool swim-up bar. Relax with a massage, wrap or facial at the spa. It’s almost as if this place knows how long you’ve been looking forward to your trip, and does everything in its power to make your stay unforgettable. Take advantage of the available all-inclusive plan to take the hassle out of your vacation. From the moment you set foot on the beachfront property, the Grand Residences Riviera Cancun staff lavishes you with welcome drinks and gifts like an artisanal handbag, Alebriji figure and traditional women’s necklace – plus personalized cookies and gifts for the kids. (PS: There’s a gratis bottle of Tequila and fresh fruit in your room as well.) No wonder they have a 5.0 Rating on TripAdvisor! Once you’ve changed and headed for the two outdoor pools, you’ll discover luxe touches like Evian Facial Spray, ice lollipops – even a five-minute sunscreen massage. The few underwater kicks it takes to get to the swim-up pool bar may be the most effort you’ll expend all day. There’s even a children’s pool for the little ones that’s just their size! Drop the kids off at the on-site children’s club and get in touch with your inner athlete at the on-site sports center, a workout at the well-equipped fitness center or a massage at the on-site full-service spa. Spacious one- to three-bedroom condos sleep five to ten guests and are air conditioned. Full Kitchens allow you to save money by making your own meals. Bring the kids along to the on-site convenience store to stock up on groceries. Save a trip to Starbucks and brew your own espresso on your in-suite Nespresso Machine! If you’re up for a low-key night in, Flatscreen TVs with Cable have you covered. Gather everyone on the couch, put one of the kids on snack duty and another in charge of the remote. Or bring movies from home to watch on your DVD player. In-suite washer/dryers allow you to pack lightly. When the kids have finally fallen asleep, enjoy a glass of wine and a relaxing in soak in your in-suite jetted tub. - Airport shuttle service is available on request. Contact the property in advance to make arrangements. Guests who require airport shuttle pickup service must contact the property at least 48 hours in advance with their arrival details. Please contact the office using the information on the reservation confirmation received after booking. Guests staying through a Saturday night may be required to move rooms with hotel assistance. For more details, please contact the office using the information on the reservation confirmation received after booking. All-inclusive room rates at Grand Residences Riviera Cancun are available. These rates are higher because they include onsite food and beverages in the room rate (some restrictions may apply). 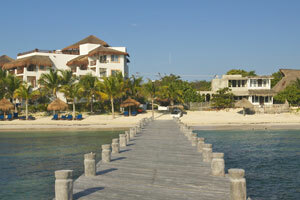 Located in Quintana Roo, halfway between Cancun and Playa del Carmen, and known as the "Jewel of the Mexican Caribbean." Check out the National Reef Park, perfect for snorkeling and scuba diving. Swim with turtles and tropical fish in the Mesoamerican Barrier Reef.